Ever wary (and weary) of plagiarists, Mark E. Smith probably disliked cover versions of Fall songs. Nevertheless, there are quite a few of them. 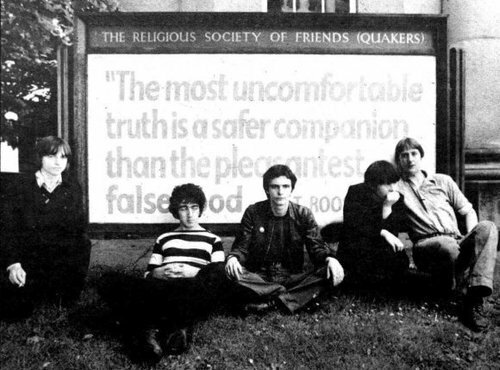 MES had no love for Sonic Youth or Pavement, two bands that were greatly indebted to The Fall. Deadbeat descendants, you might call them. Pleasant companions. Safer listening perhaps than the uncomfortable, undilutable slang truth. In fairness, I quite like Wowee Zowee and the Sonic Youts of 85-88. And in truth, the Fall Sound was occasionally diluted, its singer sometimes sadly dissolute. I prefer my covers well done; but even those that don't measure up or add anything to the originals are interesting to hear, at least once. My lousy self-copulating covers collection is listed in the comments. Not all here are ace: some are lousy, embarrassing, even unpleasant. Hideous replicas. I was surprised to find that the Fall song covered most often is "Hotel Bloedel". There are many fans and musicians who look up to Brix, and some of them may have covered the song in tribute to her influence. Or maybe they chose "Bloedel" simply because it is a gem of a song. 16 CASEY SPOONER - C.R.E.E.P. 14 BRIX AND THE EXTRICATED - L.A. I owe many thanks to The Fall Online Forum for pointing me toward some of the songs shared on this blog today and yesterday. Members of the FOF created three cover/tribute albums: "The Frenz Equivalent", "Hex Enduction Ours" and "The Real New Forum LP". Links to those three albums can be found on this thread, as well as some lovely original songs, prose and poetry. Great job with this extensive Fall covers compilation, thanks from @Timebender. Sorry to be a bother Jonder, but is there any chance you could provide the images used with all the Fall related compilations. Front covers for the folders essentially. Thanks from @Timebender. Thanks for the images jonder, from @Timebender. NEWS FLASH! Honey Radar has released a cover of The Fall song "Middle Class Revolt". Thanks to Peecat for the heads up. Jeffrey Lewis releases "13 Fall Songs" this week, a spiritual successor to his "12 Crass Songs".